The library is pleased to present this class for adults and older teens free of charge. Local DEC Forest Ranger Jay Scott will teach you the skills necessary to navigate the wilderness surrounding our wonderful town. 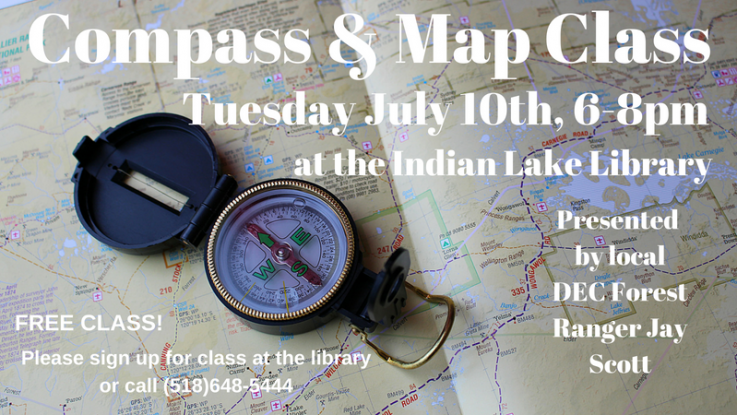 The class takes place Tuesday July 10th 6pm – 8pm. It takes place after hours, so please be sure to sign up at the circulation desk or by phone (518)648-5444. Knowing how to use map and compass is an essential skill for outdoor exploration. Jay will present a classrooom portion and an outdoor practical experience to try out new skills.